If you read this article regularly you’ll know that January and February real estate sales numbers in SW Florida were ho-hum in terms of sales counts and prices. In March, that all changed. Agents wait for official numbers to be released around the 23rd-26th of each month, however we had some early indications things were going to be good even before that. 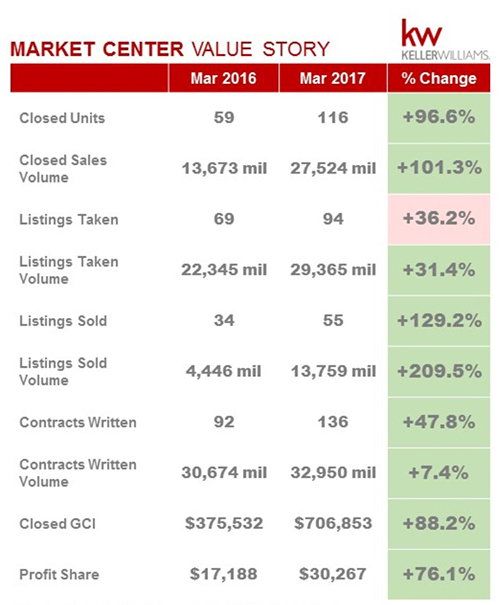 We are pleased to announce that Southwest Florida March real estate sales numbers rebound nicely. One of the things we love about our current real estate company is that they are fully transparent with their numbers. They must be because they profit share out to the agents. As such, we get early numbers which is useful information. I noticed our profit share check was larger than month’s past, so I looked at our internal numbers. Because we market properties for our clients, I like to compare our numbers versus the rest of the MLS to see how we’re doing. In real estate, we don’t control the market. The market could be good, bad, or sideways and either way agents need to sell their clients properties. If an agent wants to increase their volume in a down market, they’ll need to go steal some market share from somebody else. You can’t properly evaluate your numbers if you don’t know what they are. So, here’s what we know. The local board sales were up 18.1% from last year. Our office was up 96.6%. Median sales price was up 13.3% in March and average sales price was up 19.1% This leads to dollar volume, a metric we’ve been talking a lot about lately. It measures the overall health of the market. Simply, if you multiply average sales price by number of units you’ll get the total dollar volume. When both numbers are up, you know you’re going to have an increase over the past year. It’s simple math. Board dollar volume was up 40.6%. That’s a fantastic number. Our office volume was up 101.3% for the same period. Our agents killed it! It’s important to track numbers because sometimes as humans we get lost in success. For instance, let’s say your office was up 20% in sales over last year. You might say wow, we’re doing everything right. When you later learn, the board was up over 40% that number doesn’t seem so good. On Wall Street investors would hammer a company that isn’t keeping up with the market. Agents should never measure the market’s success by their own. Often sellers will ask an agent how the market is. Many agents don’t know. Perhaps they personally had a good month last month so they say the market is on fire, when in reality the market may be down. Clients deserve to know what’s really going on, not how the agent feels right now based upon personal production. It’s important to track overall market statistics. Only then can you best guide a seller. It’s also important to track your own numbers. How will you know if your marketing is working if you don’t track? How will you know if you’re pricing properties correctly? Perhaps an agent out there is advertising somewhere that is producing results. Possibly there is a new technology driving sales you should be aware of. Perhaps it’s just old-fashioned hard work, education, and proper pricing that’s working for an agent. The point is, agents should always be studying what’s working and what’s not. Eliminate the things that don’t work and do more of the things that do. Just because you’re having a good month don’t assume it’s good enough. If you’re having a bad month, don’t assume everybody else is. Assume nothing. Study the market. Look at your company profit share checks. If your company isn’t profitable, what could you do to change that? We owe it to our buyers and sellers to explain what’s really going on in the market so they can make good decisions. Study how your company is doing against the market so you can explain your value proposition to them. Clients want to know. They need to know. Feel free to call us at 239-489-4042 or Search the Southwest Florida MLS We’ll get your home sold fast or help you buy a new one. Put our marketing to work for you! Posted in Cape Coral, Cape Coral Real Estate, Fort Myers Beach, Fort Myers Real Estate, Southwest Florida Real Estate.Tagged Keller Williams Fort Myers & The Islands, Southwest Florida Real Estate Market Numbers.